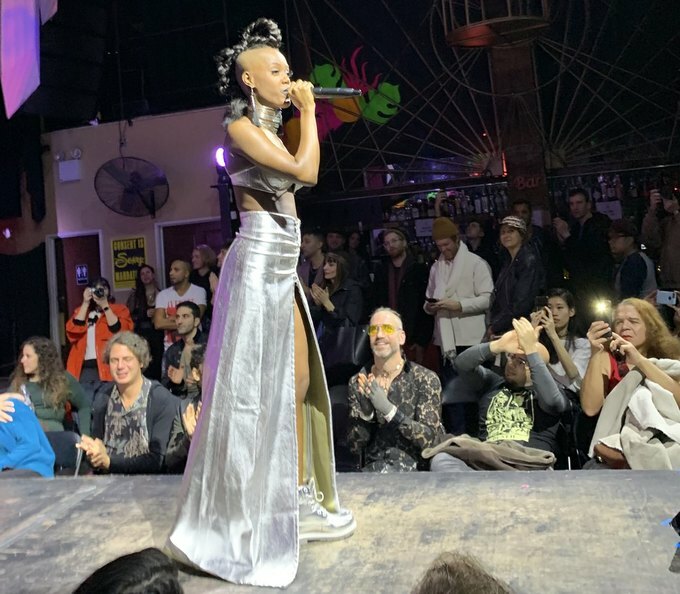 The vibe of Bushwick Fashion Night, which took place this past Sunday evening at House of Yes, felt like an antidote to New York Fashion Week (NYFW), currently ongoing in midtown Manhattan. 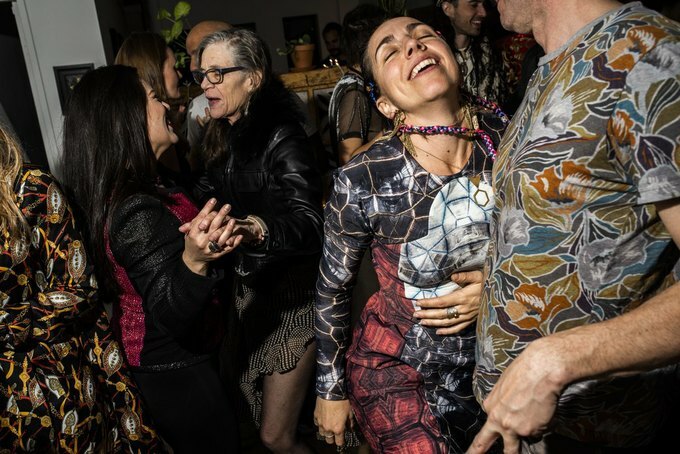 Filled with curvy, glowing bodies voguing down the runway in asymmetrical cuts, clashing prints, plunging necklines, and baggy, often androgynous silhouettes, it felt like an avant-garde flea market that happened to take place in an underground nightclub. The event featured a “marketplace” in the lobby, where guests could purchase designs from the runway directly from the designers. 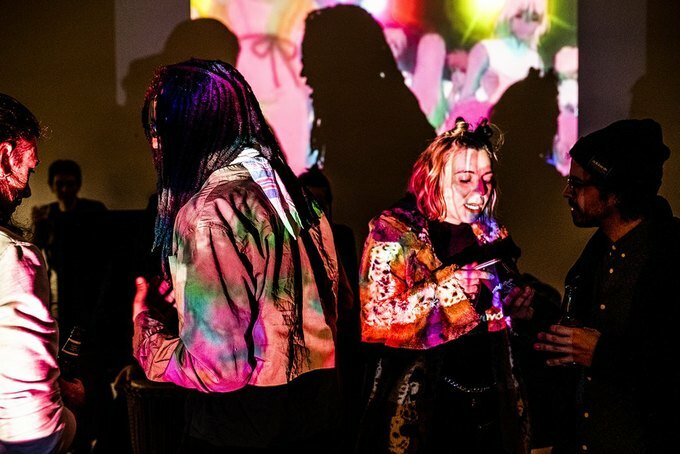 The show was organized by Oliver Correa of HiFi Collective and Sasha Charoensub of Bushwick’s The Loner. This is the second fashion show the pair have put on. The first took place last year, also during NYFW. Both shows were intended as a way to subvert NYFW’s history of celebrating conventional beauty standards, and to provoke new ways of thinking about what fashion can be and represent. Charoensub said that she and Correa had a shared network of talented people in the local fashion and music industries, whom the pair hoped to share with the neighborhood. The designers for the show were all friends, or people separated from them by one degree. 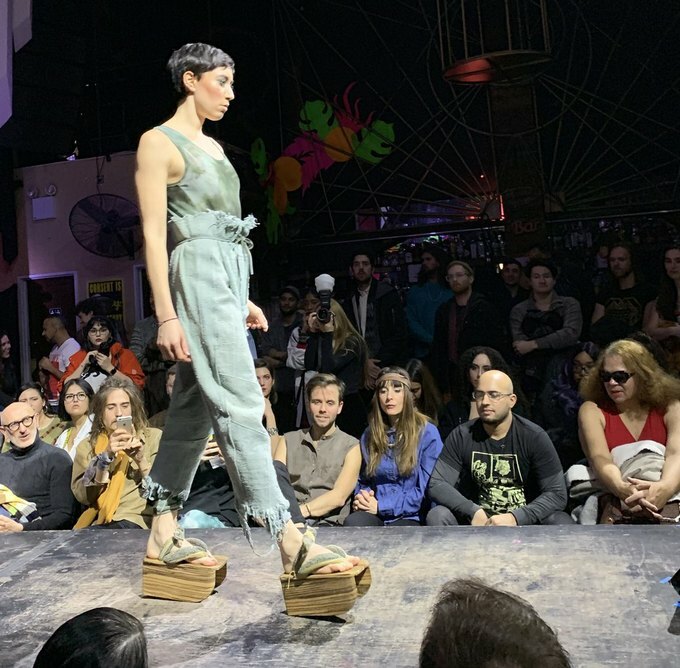 Sick of having to travel to “mainstream events” in midtown to see runway fashion, Charoensub wanted to create something that was accessible to people in Bushwick, both physically and aesthetically. A model wears a design by Michiyo Hayes Kuramochi. Akil Apollo Davis poses during the final runway, in a piece from Kimonos by Taj. A model wears a shibori-dyed jumpsuit and geta-style sandals by Hanoux. Designers for the show focused on sustainability, upcycling, global styles and textiles, and designs for people with non-standardized body types. Michiyo Hayes Kuramochi is a Tokyo-born, London-based designer with a focus on upcycling secondhand and “deadstock” fabrics from the 1980s and 90s, and with whom Correa has been in discussion for over two years. Marlie Hall’s Free by Marlie creates soft, high-quality wigs from human hair with a focus on women of color. 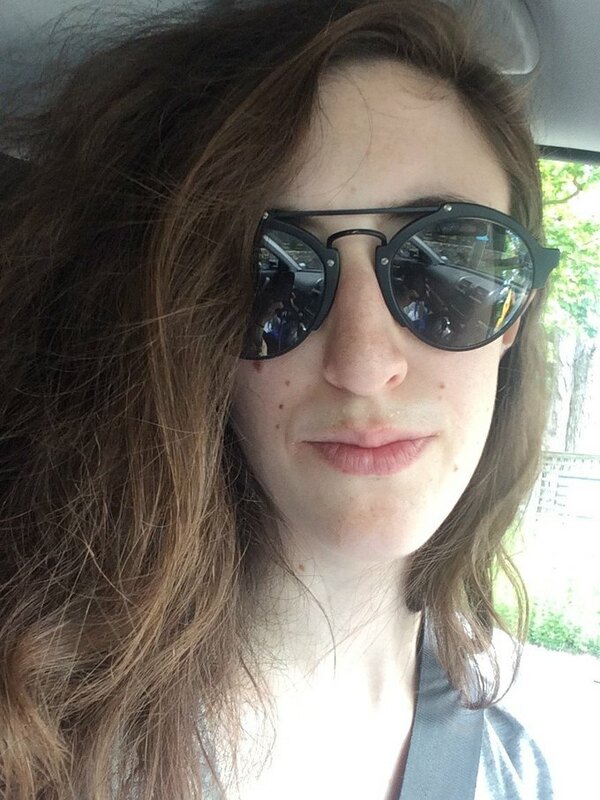 Jessica Hoff of Jessica Hoff Fashion makes onesies especially for women with larger chests and curvier frames, inspired by the challenges she faced as a ballerina with double-D sized breasts. The models, many of whom work full-time as dancers, teachers, and performing artists, added cheeky bits of flare to their walks. 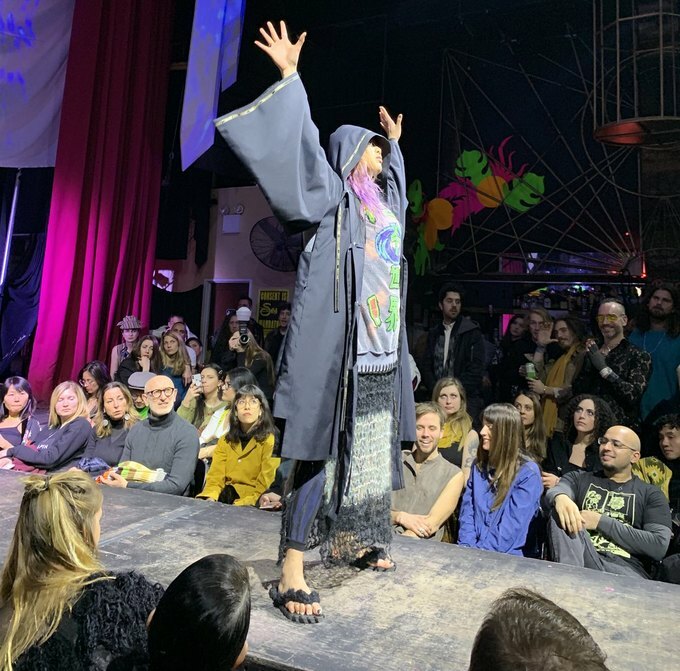 During Michiyo Hayes Kuramochi’s runway, a pink-haired model wearing a floor-length hooded cloak raised her arms to the ceiling like a Benedictine monk, to nearly unanimous applause. 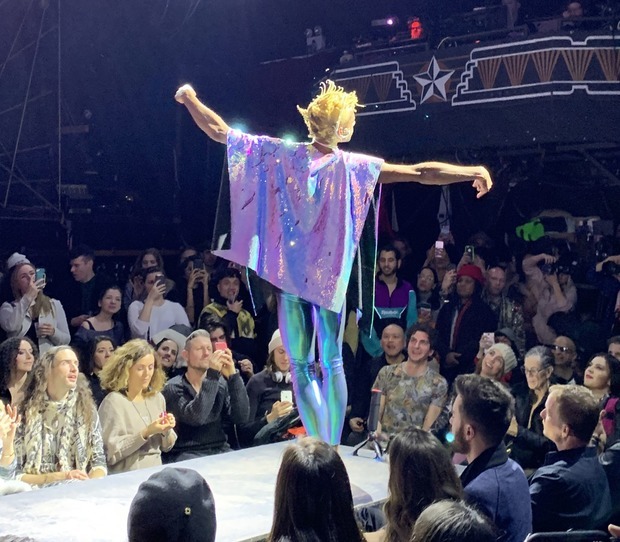 A model in one of Jessica Hoff’s designs, a blond-dreadlocked man in iridescent pink and blue tights and a cape, posed like a classical statue at the end of the runway, a curved arm reached out toward the rafters. Models double as acrobats, clad in jumpsuits by Hanoux. The final performance of the night. 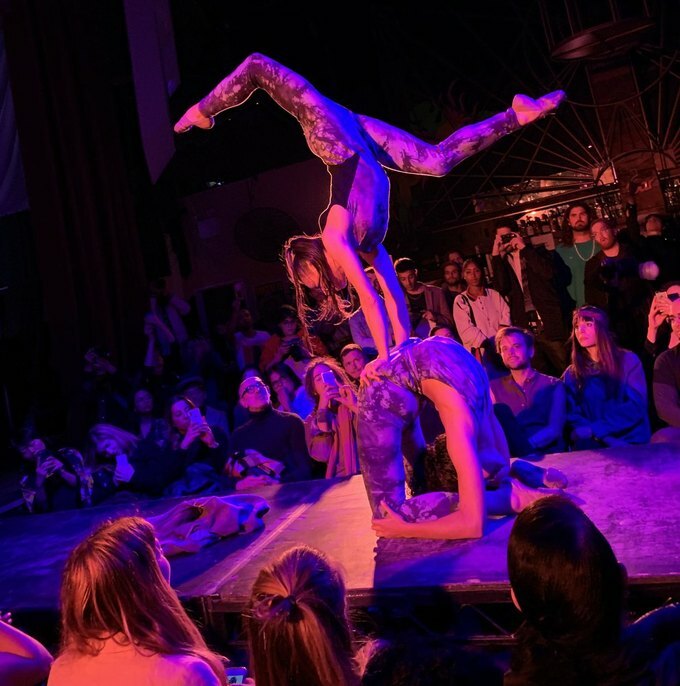 Though the entire night felt like one huge performance, sections were broken up by well-executed dance and acrobatics numbers that served to reinforce and build on the show’s aesthetic. Michiyo Hayes Kuramochi’s runway was followed by a lusty acrobatics performance in which two models clad in shibori-dyed bodysuits by Hanoux, coiled around each other in increasingly precarious poses. A trippy dance number by two twerking, leather-clad dancers set to rave music came after SERAHTONIN. 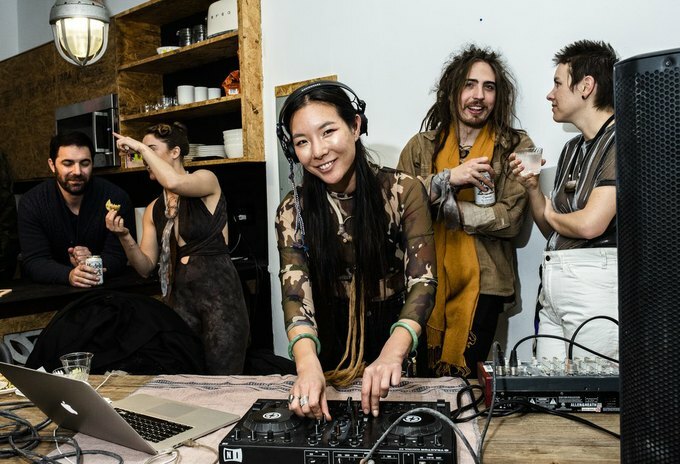 At the after party, hosted by coworking and living space and events company venn at 786 Knickerbocker Ave., things were decidedly more chilled out. 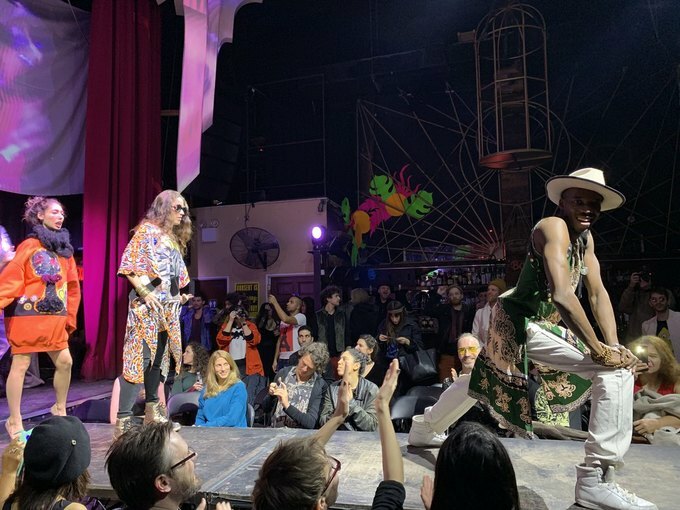 I made eye contact with one of the models, acting teacher and performer Akil Apollo Davis, only to discover I had taken a photo of him looking in my direction on the runway. He showed me one of his creations, a wooden mask topped with sixty coats of gold paint, which he called an “intention-based” mask. While making the drawing, he told me, he “fills it with intention” before sending it off to a Balinese mask-maker. The mask is used to train actors during his classes at SUNY Purchase and William Esper Studio in Midtown. 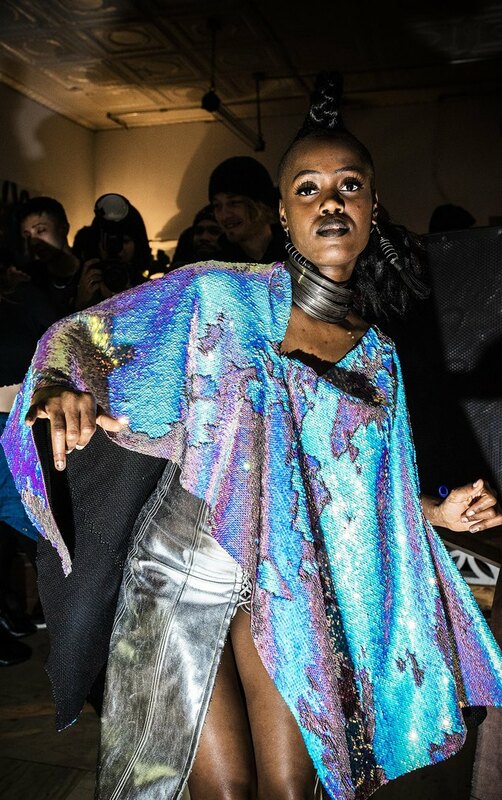 Overall, the show was a sublime mixture of expression and empowerment, as well as a chance for local designers, artists, and community members to network and to see their values and aesthetics reflected on the runway. If Bushwick represents the new frontier in fashion, Correa and Charoensub are right there at the helm. Afterparty, photo courtesy of Venn. All photos courtesy of author, unless otherwise specified.